Is it possible for a house to respond to the needs of a young family and be flexible to respond as the kids grow and move away? Is it possible to develop an environmentally responsible house that is also contemporary in design? Is it possible for a house to have everything? 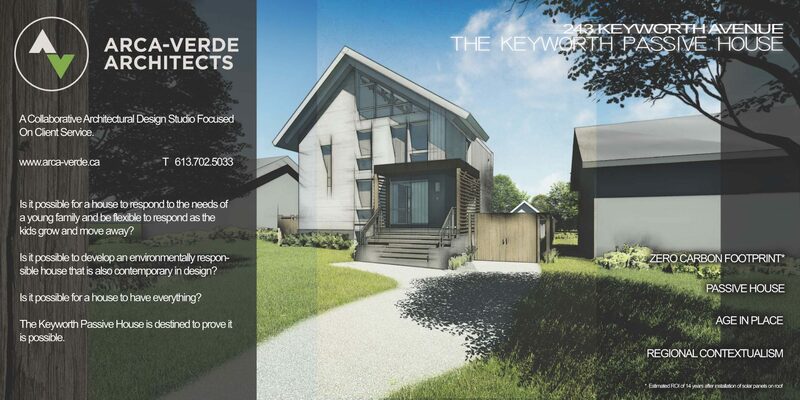 The Keyworth Passive House is destined to prove it is possible. Champlain Park has seen many recent rejuvenation projects, often increasing neighbourhood density. It is truly a neighbourhood in transition. 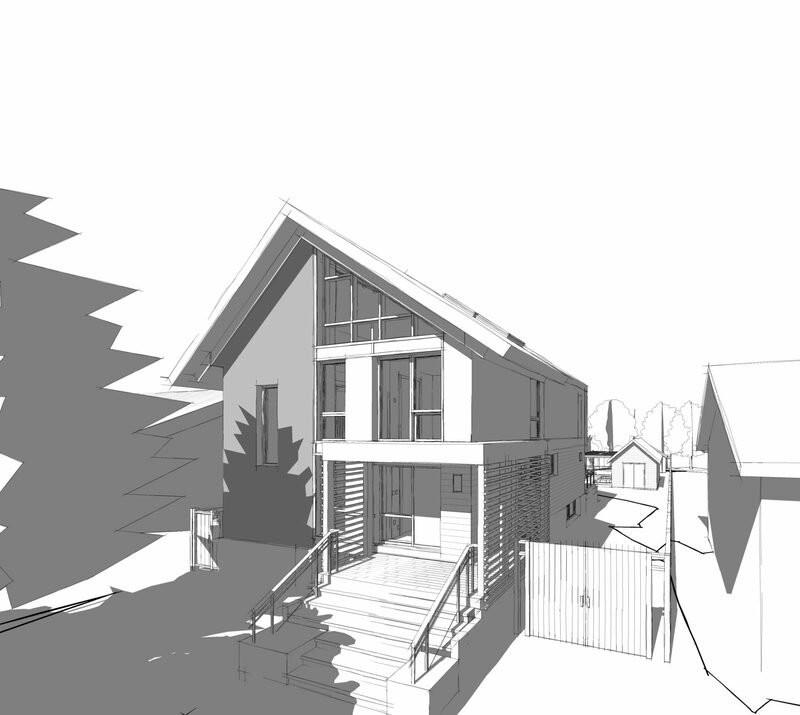 The Keyworth Passive House is a demonstration of balance between the family needs, environmental responsibility and respect for the neighbourhood context resulting in a new architectural language. Three obstacles turned into opportunity. It is important to ARCA-VERDE to arrange the house so that it does not appear large. The form and sloping roofline serve to reduce the presence of the structure on the street. The result is an expression that is elegant and unimposing. The house is composed of a single compact and efficient volume. 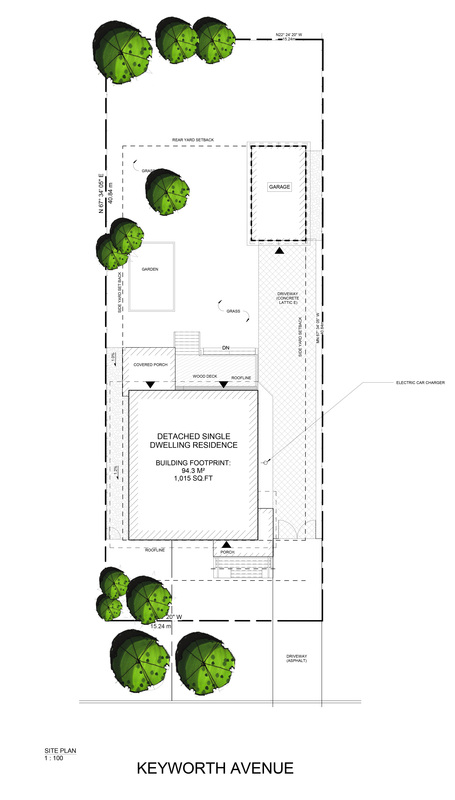 The house location is nestled against the west and north property lines to permit maximum solar exposure. The outcome is a compact and efficient interior layout. The garage location creates a pseudo side lane permitting access to the back door. The back entrance releases the front façade to be the formal entrance and street presence. All everyday family functions can occur through the informal entrance. The Keyworth Passive House is an important project for the firm as it is through this project that our approach to houses developed. The open concept plan creates the intended expansive interior views, which allows maximum penetration of natural light and offers few obstacles for natural ventilation. However, the planning presents areas of repose and isolation. 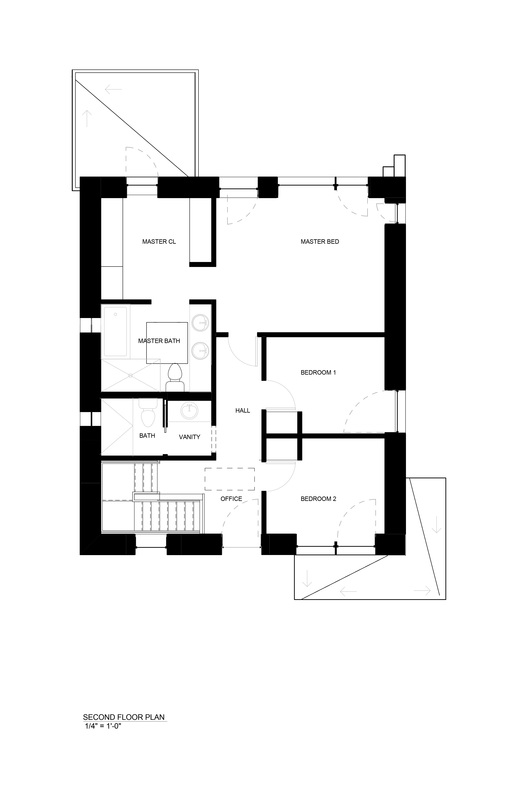 In either the spa-inspired washroom, private master bedroom or the studio space on the loft level, each space aims to be a place to seek independence or recharge when needed. It is an ARCA-VERDE desire that all technology within a house have little to no presence. This can be difficult with sustainable ideals but by allowing the architecture to be the first response, it is achievable. Rather than relying on technology or equipment to heat, cool and ventilate the building shape, interior configuration and placement of windows is all that is required. The house shape promotes natural ventilation with low windows that allow air to enter the house and rise up to the higher windows on the opposite side of prevailing winds. The east-west orientation with large windows facing south allows the winter sun to heat the interior almost eliminating any need for supplemental mechanical heat. This also allows adequate natural light in all rooms. The windows created a connection with the exterior courtyard blurring the line between interior and exterior space providing a bigger interior feel. In order to allow for the family growth and change, the house must respond to three stages; firstly, all family members living in the house before the kids leave for University; secondly, the empty nest period when the kids have moved out permanently; thirdly, should one or both owners develop physical mobility issues. The development of three zones within the floor plan serve as the private, semi-private and public separations. The first being the first floor (semi-public section) with the dining, living and kitchen rooms. 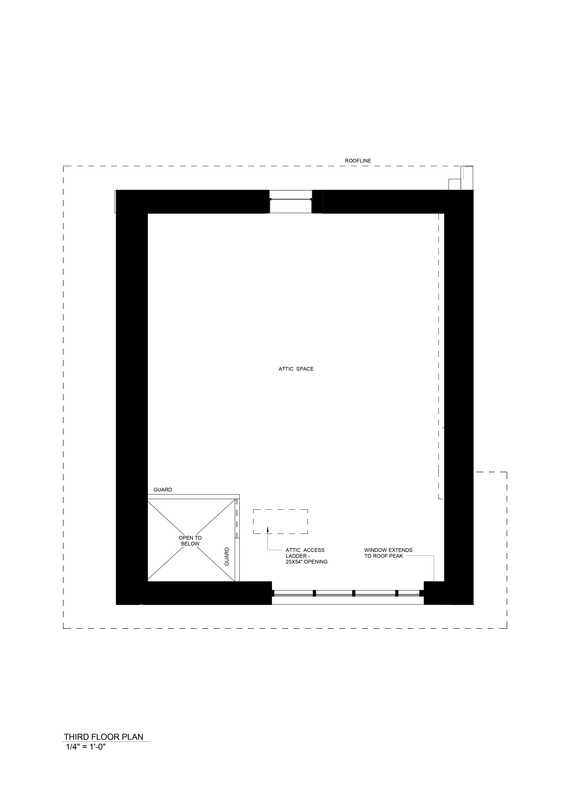 The second zone is the 2nd and loft storey (private). The third is the outdoor zone (public). The first zone is the formal zone when full occupancy occurs. While entertaining the dining room is large enough to host 8-10 people with comfort. The kitchen, designed to be the hub of the house, is modest in size but has a large amount of storage. The living room is a formal area with conversational seating. When operating in the second stage of the existence the couple occupy the upper 2 storeys and rents out the lower storey. In the third stage, this area becomes the couple’s should mobility be an issue. Little work would be required to accommodate the changed function. 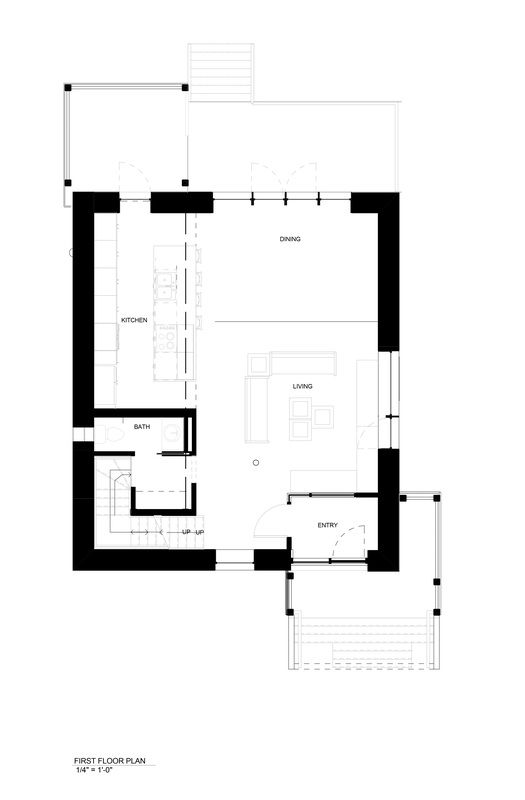 The kitchen remains, the washroom and closet area will receive a stand-up shower or modified tub (planned for with design), and the living room becomes the bedroom. A ramp, planned for this stage, allows access to the front door. The upper two storeys will be modified, once the kids have moved out, to include a kitchen, living room and dining room. By removing the bedroom walls, the upper floor will be modified to create a loft suite area for the couple. The functional layout intends to be void of formal circulation. Overlapping functions foster a creative and friendly environment without bolstering the house size. Two wood-burning fireplaces are located at center of floor plates to maximize their efficiency. ARCA-VERDE has considered every detail in the Keyworth Passive House. The placement of functions and arrangement of space creates an economy of space. Designing with the environment in mind creates a home with a low impact on the earth, a bright interior, and reconnects occupants with exterior environment. In the most basic of explanations, ARCA-VERDE turned each of the project challenges into an opportunity to develop something of merit.